General Hospital (GH) spoilers for Monday, December 18, tease that Liz (Rebecca Herbst) will be upset over Franco’s (Roger Howarth) lies. He’ll make a full confession about knowing the twin truth before the big reveal. Liz will lash out at Franco for keeping his mouth shut. She’ll be frustrated by Franco’s trust issues and string of bad decisions. Franco will promise that he’s going to be nothing but honest from now on. He just wants to clear his conscience and get their love story back on track, but Liz may need some time to process this. 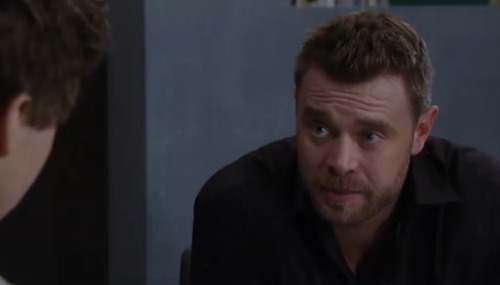 Meanwhile, Sam (Kelly Monaco) will give Drew (Billy Miller) her answer. It appears she’ll accept his marriage proposal and prepare to put Jason (Steve Burton) in the rearview mirror. Later, Carly (Laura Wright) and Sam will have a heated confrontation. General Hospital spoilers say Carly will think Sam’s in denial over her love for Jason. She’ll wish Jason and Sam would stop trying to be so noble. Sam will accuse Carly of being selfish and Carly will admit it. However, she’ll think a little selfishness is OK is long as it comes from an honest place. While Carly urges Sam to choose Jason, Drew will seek a fresh start with Oscar (Garren Stitt). They got off on the wrong foot, but Drew will hope he can make things right. He’ll point out that he can’t remember anything from his old life. Drew will suggest that he’s been a bit overwhelmed, so maybe he didn’t express his feelings adequately. He’ll make sure Oscar knows that he wants to bond. Other General Hospital spoilers say Jason and Sonny (Maurice Benard) will rehash the traitor situation. After Jason passes along Andre’s (Anthony Montgomery) updates, he’ll insist that they have to give Drew his memories back. Jason will think Drew may have some crucial facts buried in his brain. Across town, Jordan (Vinessa Antoine) will be concerned about Anna (Finola Hughes). She’ll sense that something’s bothering her, so she’ll push Anna to open up. GH spoilers state that Anna and Jordan will connect during this conversation. They’ll discover that they’ve shared some similar experiences. Elsewhere, Maxie (Kirsten Storms) will face a request from Lulu (Emme Rylan). Despite having a million items on her holiday to-do list, Maxie will undoubtedly step up for Lulu. That’s what friends are for! Maxie will be planning Kevin (Jon Lindstrom) and Laura’s (Genie Francis) wedding as well as working on a few other projects. She’ll definitely have a lot on her plate. It sounds like a great episode’s coming up. We’ll keep you posted as other GH news emerges. Stick with the ABC soap and don’t forget to check CDL often for the latest General Hospital spoilers, updates and news.